Brass Knuckle safety products has introduced the SmartShell BKCR4599, heavy-duty gloves offering protection for extreme jobs. 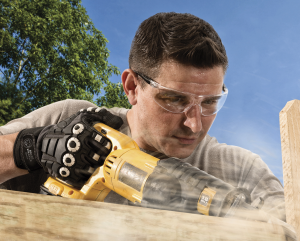 Brass Knuckle safety products has introduced the SmartShell BKCR4599, heavy-duty gloves offering protection for extreme jobs. The BKCR4599 offers ANSI level 4 cut resistance, light oil and moisture resistance, non-tacky slip resistance and shock-absorbing impact protection. On the palm and fingers, the glove features three layers of protection. The liner is polyethylene and spandex composite that is bonded to a gray polyurethane fabric topped with a grippy nitrile surface. In critical areas of the palm, padding provides impact resistance. The back of the hand includes sonically welded thermoplastic rubber padding for pounding and abrasion resistance.